If Helen Mirren is attached to a movie, you can pretty well guarantee the quality of the acting and story will be above standard. In this film directed by Simon Curtis (My Week with Marilyn) and written by Alexi Kaye Campbell it is based on the true story of Maria Altmann and her lawyer E. Randol Schoenberg. The artwork looted by the Nazi's in World War II was subject to restitution efforts, but most were systematically frustrated by governments, museum officials, dealers and buyers. According to the blurb during the credit roll, more than 100,000 stolen works of art are still unaccounted for. Mirren plays Maria Altmann who hires the lawyer son of a family friend in 1998 Los Angeles. Randy Schoenberg (Ryan Reynolds) had tried to make it on his own, but he failed and now is in debt. He gets hired by a big law firm, mostly on the reputation of this grandfather, a famous composer and his father a renown judge. He takes a look at Maria's claim that the infamous Gustav Klimt's iconic painting of her aunt, Portrait of Adele Bloch-Bauer I, as well as several other Klimt paintings, really belong to her. According to the Austrian museum where the paintings now resides, the paintings were willed to them, but no one has seen the will. Randy discovers the painting which is covered in gold foil, is worth at least 100 million dollars. As he is in debt, he sees this as something to pursue. He convinces the reluctant Maria to return to Austria. She swore she would never return after she escaped the country during the Nazi invasion. Bits of Maria's history of life in Vienna are lovingly told about her mother, father, sister, her uncle and his wife Adele. They were blessed with an good life filled with artists and musicians. Her uncle tries to persuade her father to leave for Switzerland before the Nazi's show up, but her father believes the Austrian government won't concede but which they later welcomed with open arms. Orphan Black's Tatiana Maslany plays Maria as a young woman who just married her opera singing husband Fritz (Max Irons). They make a terrifying escape to the United States having to leave her ailing parents behind. During the trip to Vienna, Randy comes to some catharsis and acceptance of his heritage. With the help of Hubertus Czernin (Daniel Brühl), an investigative reporter who is working out his guilt of having Nazi relatives by trying to rectify the wrongs that are still plaguing his country, they find the real will of her uncle the rightful owner of the artwork. But the restitution committee in charge are too connected with the museum that want to keep what they deem the Mona Lisa of Austria. It takes years, and the loss of Randy's job for them to finally take their legal battle to the Supreme Court of the United States. Then finally to the arbitrators in Austria. The journey for Randy and Maria is brilliantly played by the chemistry of the two stars. 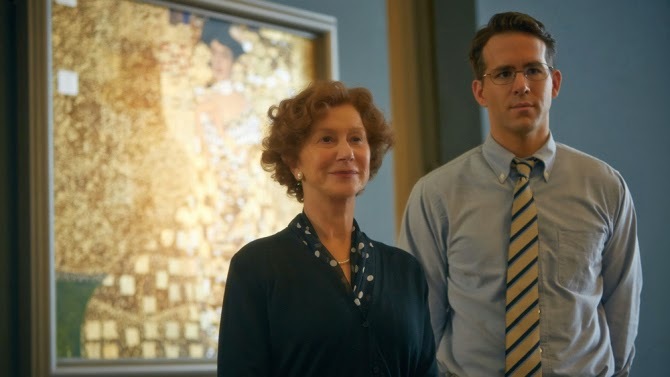 Reynolds is a revelation as the nerdy, nervous lawyer who finds his passion. Maria is tough and vulnerable coming to terms with horrors of her past. This is probably one of the best and satisfying movies of the year....so far. DIFF2015: She's the Best Thing In It.